US personal consumption fell by 0.2% in January following a 0.3% decline in December. The figure, the first back-to-back monthly decline recorded since early 2009, was below expectations for a fall of 0.1%. While the headline reading missed, after removing the impact of a 0.5% decline in prices, real consumption jumped by 0.3%, the 12th consecutive month that an increase has been recorded. As opposed to consumption which fell incomes continued to grow with an increase of 0.3% reported. The reading, in line with the gain recorded in December, fell fractionally short of expectations for an increase of 0.4%. With incomes rising as consumption fell the national savings ratio increased to 5.5% from 5.0% in December. US manufacturing activity accelerated at a slower pace in February with the ISM’s PMI gauge slipping to 52.9. The reading, below the 53.5 level of January and expectations for a decrease to 53.0, left the index at the lowest level seen since January 2014. Overall measures on new orders, production, employment, exports and imports all deteriorated during the month, offsetting improved readings for deliveries, inventories and order backlogs. US construction spending fell by 1.1% in January, the steepest fall since June. The reading was well below the 0.8% increase of December and expectations for a further rise of 0.3% with both private and public spending falling during the month. Eurozone deflationary forces eased in the 12 months to February with the flash inflation reading from Eurostat rising to -0.3%. The level was higher than the 0.6% drop of January and expectations for an increase to -0.4% with core inflation, that which excludes energy and unprocessed food prices, remaining unchanged 0.6% for a second-consecutive month. Eurozone unemployment fell to the lowest level since April 2012 in January with a decline to 11.2% reported. The reading was below the downwardly-revised 11.3% level of December and expectations for an increase to 11.4% and left the 12-month decline at 0.6%. Eurozone manufacturing activity expanded at a slower pace than initially reported in February with the final PMI reading from Markit coming in at 51.0. The figure, below the 51.1 flash estimate released late last month, was unchanged from what was reported in January. The performance of the ‘Big 4’ Eurozone economies, Germany, France, Italy and Spain, can be found below. Italian unemployment fell to 12.6% in January, lower than the downwardly-revised 12.7% rate of December and expectations for an increase to 12.9%, with level the lowest seen since June 2014. UK manufacturing activity improved at a sharper rate in February with the Markit/CIPS PMI gauge rising to 54.1. The reading was higher than the 53.1 level of January and forecasts for an acceleration to 53.4 and was the highest level achieved since July 2014. A triple-whammy of misses from UK credit metrics released overnight with mortgage lending and approvals, along with consumer credit, undershooting expectations in January. Housing credit expanded by £1.558b, below forecasts for an increase of £1.7b, while mortgage applications came in at 60,786, lower than 61,000 pace expected. Completing the trio of data misses consumer credit rose by £817m, higher than the £516m level of December but below estimates for an increase of £900m. UK house prices fell unexpectedly in February with the Nationwide house price index slipping 0.1%. The decline, the first seen since September, was below the median market forecast for a rise of 0.3% and left the annual increase at 5.7%, down from 6.8% in January. The expansion in Indian manufacturing activity slowed sharply in February with Markit’s PMI gauge sliding to 51.2. The reading, below the 52.9 level of January, was the lowest level recorded since September 2014. The ASX 200 looks set to test the 6000 level today with SPI futures pointing to a gain of 14pts on the open. Whether the index can move above this level and hold there will likely come down to the RBA’s rate decision this afternoon. A cut will almost certainly propel the index higher on the back of gains in higher-yielding sectors while a non-move, something that is slightly less favoured by the market, will see short-term profit-taking ensue. Still, while a non-move may disappoint short-term, the subsequent strength in the Australian Dollar may actually support the index longer-term by making the index look more attractive to yield-hungry international investors. Risks are far more skewed to the upside than downside. That, in a nutshell, is the state of play for the AUDUSD today before the RBA rate decision at 2.30pm this afternoon. 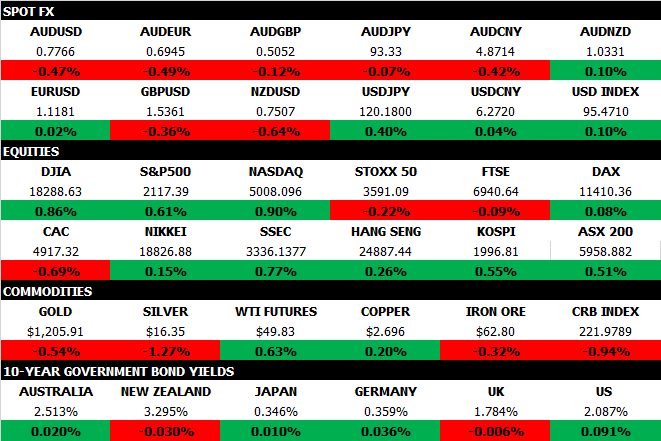 With markets continuing to favour a cut, coupled with short-term speculative positioning, the pair could well soar should the RBA decide to leave rates unchanged later today. In order to get the response they are looking for, a lower currency, the Board will need to cut interest rates by 0.25% and add an explicit easing bias into the final paragraph of the statement, something that will indicate they will continue to move rates lower should the need arise. Such a move will likely see the AUDUD test .7625, the recent low struck in early February, while a non-move has the potential to send the pair back above the .8000 level should selling resistance above .7900 give way. The Reserve Bank of Australia announce their March monetary policy decision at 2.30pm this afternoon. I expect the Board will cut the cash rate by an additional 25bps following their move in February to help buttress inflation and growth expectations over the medium term. While it’s not a given that the RBA will ease, cash rate futures currently put the odds at 60pct, at the very least I expect the Board will insert a definitive easing bias into their statement given the absence of one in February. Given further evidence of increased investor activity, particularly in capital cities along the East seaboard, I expect they will also use more-forceful language when it comes to recent developments in the established housing market. Australian data releases today include building approvals for January along with Q4 net export contribution and current account, both GDP inputs. All will be released at 11.30am. On the regional front markets will also receive South Korean CPI. Data releases this evening include the latest ISM New York index from the US, GDP and producer price inflation from Canada, retail sales from Germany and Hong Kong along with UK construction PMI.